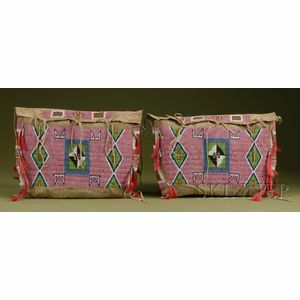 Pair of Plains Beaded Hide Possible Bags, c. early 20th century, the front, sides, and flap with multicolored geometric designs on a pink background, with red horsehair and tin cone danglers, 16 1/2 x 12 in. Provenance: Lammers Trading Post, est. 1917, Hardin, Montana.